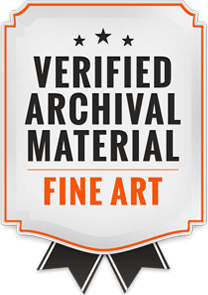 Archival mounting is key in the protection and presentation of your photos and fine artworks. Back-mounting options give stability and allow your photo and artwork to be displayed properly. Our service is available on Styrene, Foamcore, Ultra board and under Acrylic glass. Using the latest in pressure sensitive adhesives, archival boards, and mounting equipment, we take care of your prints to be displayed at their very best in any situation. Styrene is a thin white plastic mounting substrate that resists warping, making it an excellent choice for adding durability to prints of all sizes. It is roughly 1 millimeter thick and has a completely smooth surface. It is acid free and thin enough to fit into a frame. Foamcore, also called foam board, is the most popular addition to prints that are to be framed or displayed temporarily without a frame. It is 3/16" thick and easy to cut. It does have a tendency to warp, which is most noticeable on large sizes (16x20 and up). Stronger than Foamcore but with a similar weight, Ultra board is an excellent choice for photo mounting, exhibits, and indoor displays that require rigidity, durability, and warp resistance. The rigid polystyrene foamcore of Ultra board rests laminated between resin-infused wood fiber veneers, which gives it a harder surface than Foamcore and makes it moisture resistant. As the strongest type of foam board available, Ultra board is an ideal lightweight mounting substrate. It is available in 1/4″ and 1/2″ thickness giving it a lightweight, museum quality. It is perfect for hanging on the wall with a float mount hanger (without a frame). >Important note: Mounting is only available at time of printing. We do not accept prints for mounting from outside sources or from previous orders. Size Styrene Foamcore 3/16" Ultra board 3/16"